Intel today at Computex 2015 unveiled Thunderbolt 3 with a USB Type-C connector, instead of Mini DisplayPort, and support for USB 3.1, DisplayPort 1.2 and PCI Express 3.0, as outlined by Ars Technica. The new spec's Thunderbolt transport layer provides up to 40Gbps throughput, double the max bandwidth of Thunderbolt 2, alongside an optional 100 watts of power for charging devices in accordance with the USB Power Delivery spec, or 15 watts of power without USB PD. "Thunderbolt 3 is backed by Intel's new Alpine Ridge controller. USB 3.1 support is provided by integrating a USB 3.1 host controller into Alpine Ridge. There will be two flavours of the controller, one that uses four PCIe 3.0 lanes to drive two Thunderbolt ports, and another version that only uses two PCIe lanes connected to a single Thunderbolt port." Thunderbolt 3 is capable of driving up to two 4K external displays at 60Hz or a single 5K display at 60Hz running off a single cable. Dell and other manufacturers currently use a dual-cable solution for most 4K and 5K external displays, since the current DisplayPort/Thunderbolt spec does not provide enough bandwidth to drive the high-resolution monitors. Thunderbolt 3 also supports more protocols than any other I/O controller, making it compatible with virtually any dock, device or display. Intel expects initial products with Thunderbolt 3 to start shipping before the end of this year, and ramp up in 2016. Thunderbolt 3 is rumored to launch alongside Intel's next-generation Skylake chips, succeeding the Broadwell line, later this year, and the new spec could theoretically be included in Skylake-based Macs that could possibly be released in late 2015. Refreshed Macs would likely gain USB-C ports integrated with Thunderbolt 3 as an all-in-one solution. Ok, now THAT is something! :) It all comes together. Finally this usb-c thing makes sense. Now that it shares the plug with USB, you can use a less expensive USB-3 peripheral, unless you specifically need the speed of Thunderbolt. Cables will be cheaper as well. Now suddenly the Macbook makes more sense. Not because the Macbook supports thunderbolt 3 (it doesn't) but it shows why Apple shifted to a single port type, and now I would expect the next Macbook Pro models to feature only USB-C ports for charging, thunderbolt 3, and everything else. 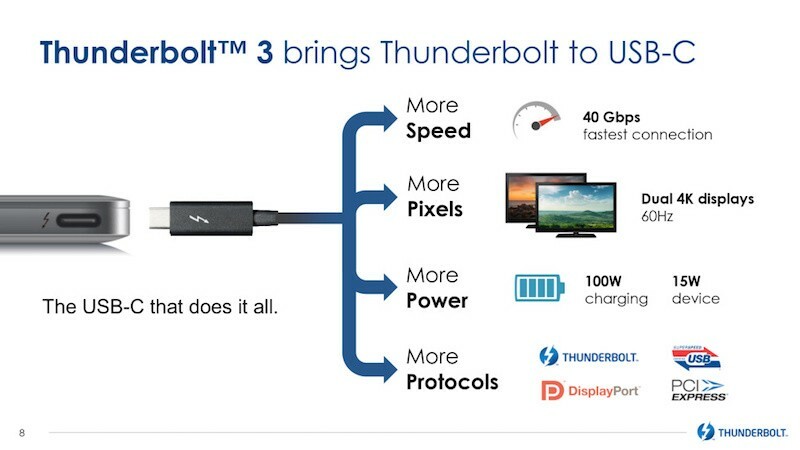 Except that Thunderbolt is never really going to be a 'for the masses' product. USB 3 (and now 3.1) offers enough bandwidth via a nice cheap passive cable to fill pretty much every mass market need on a peripheral. Thunderbolt is there for those users who need a lot more speed or need to make use of the daisy chain functionality and don't mind (or, at least, don't have a better option than) paying for the privilege. Talking of which there's another bit of this announcement MR missed out - the introduction of a passive cable. Doesn't allow access to the full 40Gbps, just 20Gbps, but it'll help bring the cost down a bit and that's still quick enough for all current TB devices. This is huge! I was wondering if thunderbolt would go away with USB-C. The fact that they are working together is major. Consumers will win out by needing only USB-C ports as opposed to thunderbolt, USB 3.0 and USB-C.
USB wins in the end. One cable to rule them all. Alright... delaying any upgrades until 2016.